WILMINGTON, NC, March 08, 2019 /24-7PressRelease/ — Nearly every day new headlines regarding the Catholic Church scandal appear on practically every media site in America. Our radio and television stations offer up endless broadcasts from yet more “mega-ministers”. Today there are thousands of different Christian “manmade” religions worldwide. Is this progress? It’s said that all things change. But the one thing that never changes is the word of God. For Christians, including modern-day Christians, this must be the starting point; the rock from which we form our collective and individual points of view. “What would Jesus say about today’s Christianity, the scandal within the Roman Catholic Church, the gluttony of American mega-ministers and the other 30,000 different Christian ‘manmade’ religions worldwide? “I believe the first thing Jesus would say is, ‘WHY DO YOU CALL ME LORD, and not do what I say? For A Kingdom or House Divided cannot stand and not everyone who says to Me, Lord, Lord will enter Kingdom of Heaven’. “To the RCC, Jesus would say: ‘Whoever causes one of these little ones to sin, it would be better for him if a millstone were hung around his neck and he were drowned in the depths of the sea’. “There are many things Jesus would say especially to American Christians who have added greatly to the divisions of Christianity worldwide, with pastors and evangelists misleading and fleecing their flock. Since the RCC is protected with wealth and its priests are cash poor, they have their own troubles in dishonesty among their inner structure. The organized corruption with the man-made religion of Christianity that started between 325AD- 397AD hasn’t stopped and will continue as long as divisions among them exists. #1. Mega Prosperity (Personality Driven) Preachers : As Christians we need to be more aware of those representing the teachings of Jesus. We must ask ourselves – do they teach by example or are they just a voice expounding from biblical memory of scripture without true understanding and life application. When we forget our past we’re doomed to repeat it. “For the record – I’m not new to the Mega Christian Movements in America. As a boy I was raised on Oral Roberts and his multi-million dollar healing hospital and Jimmy Swaggart’s jet vs Billy Graham’s peaceful conservative lifestyle. “Then as I got older, I can remember watching the rise of Richard Roberts, Robert Schuller, Kenneth Copeland, Benny Hinn, PTL (Jim Bakker), Paul Crouch’s TBN, Paula White, Joyce Meyer, Creflow Dollar, TD Jakes, Mike Murdocks and now of course the most popular Joel Osteen. “What do these preachers and evangelists all have in common? Outside of the late Billy Graham, they all lived or live multi-million dollar lavish lifestyles as Americas favored Christian Kings and Queens, all the while claiming to ‘need money’ to help feed and clothe the needy worldwide. #2. Denominations, evangelists and preachers attacking one another: It’s difficult to understand the denominations, preachers and teachers who openly attack one another while representing the ‘God of Love’. Now, some of their confrontations may be justified – inaccurate preaching, adulterous affairs and mishandling of monies. However, we must attempt to do it in love at all times. I know it’s hard for some to watch Mega Ministers get away with un-christian like behavior, and then stay in the TV ministry simply because of their mega-money-making skills. Some of the ‘behind the scenes’ behavior of Benny Hinn, Paula White, TD Jakes, Creflow Dollar, Kenneth Copeland etc., is no different than the past behavior of many others, including Oral Roberts and his son, Jimmy Swaggart and now his son, or the PTL Bakker’s and Falwell’s of the past. It’s all the same, it’s sinfully shameful. And as Christians we have all suffered for it as the world mocks us for supporting ministries that manipulate their flock for self gain. “As Christians we need to know the words of Jesus well enough to know if we should be following these personality driven ministers who may love the sound of their own voice more than the true message of repentance, forgiveness, love and discipleship in the Lord. Above all, we should be praying for their uncompromising awakening to the teachings of Jesus Christ. #3. Non-Practicing Christians: These are ones who embarrass Christianity by false confessions and dishonest behavior, while calling themselves, ‘non-practicing’ Christians. As a personal counselor, I am always surprised while talking to Christians when they say they ‘know very little of what Jesus said in the 4 Gospels’. About 90% said they never read all 4 Gospels and they actually called themselves ‘Non-Practicing’ Christians and they expect to enter Heaven simply because they once said a prayer of repentance in church or while touching the TV screen. Most of them really didn’t know what the word repentance means. And yet they expect to get into Heaven while they’re playing in Hell. “ONE WAY CHRISTIANS can HELP: Its time for ALL CHRISTIANS to know what Jesus meant when He said, “I AM the Way, the Truth and the Life”. He is our example to follow (WAY) He is the True Word of God, (TRUTH) and He lives in us and gives us LIFE. “I think we ALL need to know for sure ‘What Did Jesus Say?’ and decide how much it matters to us. Our decision determines our desire to read his words. The great Bible teacher and commentator, Henry H. Halley, said it this way: The Four Gospels are, by all odds, the most important part of the Bible: more important than all the rest of the Bible put together: more important than all the rest of the books in the whole world put together, for we could better afford to be without the knowledge of everything else than to be without the knowledge of Jesus Christ. “When you read the ‘words of Jesus’ (highlighted in red) in your Bible, you will quickly see the intensity with which Jesus speaks and teaches. When Jesus speaks He’s not vague, He’s specific. He tells us over and over again to abide in His Words, follow His example and keep His commandments. Jesus says, “By this all will know that you are My disciples, if you have love for one another”. Now, that’s specific! That’s why it’s so important to know that you know, What Did Jesus Say? The full text of the statement can be found at Terry’s website. Imagine you’re walking down the beach, and you come across a crowd waiting for Jesus to appear and teach them. What would he say? Would he talk about current religious and political conflicts, or would he speak about Love, Light, and Truth? Readers can join in for a walk with Jesus and listen to his words as he shares with them the Seven Messages from the Master. Each spiritual message reveals His teachings that will strengthen and guide anyone to a most peaceful life in Christ. ‘What Did Jesus Say’ contains over 500 Bible verses spoken directly by Jesus as recorded in the red-letter edition of the New King James Bible, organized by subject. There is no interpretation, opinion or commentary. Terry Christian’s ministry, Foundations For Life, is an online ministry dedicated to helping Christians worldwide. Their calling is to help all Christians mature in their relationship with Jesus Christ. H-E-L-P means Helping Everyone Live Peacefully in Christ. This brotherly approach allows us to focus on our loving similarities as members of the whole Body of Christ, rather than on our differences in worshiping and practicing our faith, so common today from one church to another or one Pastor to another. The mission is to teach the Way by the Word. Terry helps families and congregations, as well as clergy, come together, in love, as one body in Christ, in one accord, in order to perform a greater work for Christ. He is dedicated to creating the relationships that build stronger marriages, families and churches. 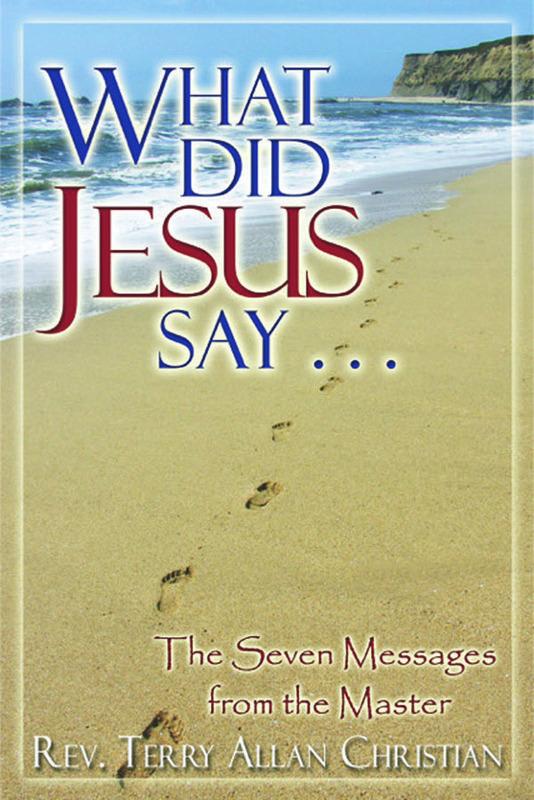 ‘What Did Jesus Say…The Seven Messages From The Master’ is available in full color glossy print, eBook and Kindle. An audiobook version is available for Windows and Macintosh. Several bundled packages are available at the book website, http://www.wdjsbook.com. Terry Christian is available for media interviews. Please contact PrimeStar Publicity using the information below. More information is available at his ministry website at https://www.foundationsforlife.org, and his book at www.wdjsbook.com. Terry Christian is a former motivational speaker and executive trainer with over 20 years experience giving more than 2,500 presentations to private and public audiences across America and Canada. Today, Christian counsels individuals and couples seeking a more mature understanding of their relationship with Jesus Christ. His life is now dedicated to helping his Christian brothers and sisters live in a never-ending state of peace, love, truth and forgiveness as followers of Jesus Christ. He says after repentance and being born again, this was the main message Jesus taught; and teaching the Way by the Word is the cornerstone on which his book and ministry is founded.